WHO IS NOT A CANDIDATE FOR PERMANENT MAKEUP UP (MICROBLADING)? *IF YOU HAVE EXISTING FADED PERMANENT MAKEUP ON YOUR BROWS, YOU MAY OR MAY NOT BE A CANDIDATE FOR MICROBLADING. PLEASE SEND A CLEAR PICTURE OF YOUR BROWS IN NATURAL LIGHTING TO 480-299-1888 BEFORE BOOKING. Those clients who have extremely oily skin may experience a different result with microblading than those with normal to dry skin. This could equate to more fading of color faster and possibly the strokes will not heal as crisp (may be slightly blurred or dotted). Those with oily skin may need more frequent touch ups at the 6-9 month mark or should consider a different technique such as a “shaded” brow rather than microblading. The pigment lasts different amounts of time on different people for a myriad of reasons. In general, after the first 4-6 week touch-up, it could last 12-18 months before fading completely. We use topical anesthetic to numb the skin before and during the procedure. Many clients find it relaxing! No. Clients are able to leave the treatment and go directly back to work or to daily tasks/errands. There will be very little redness. The brows are then healing aggressively over the next 10 days while you are using a thin layer of an ointment such as petroleum jelly to keep the brows protected. -Do not work out the day of the procedure. -Do not tan or have sunburned face. -Do not take Aspirin, Niacin, Vitamin E or IBUprofen 24 hours before procedure. -No alcohol or caffeine on the day of the procedure. -No waxing or tinting 3 days before. -Please note that you will be more sensitive during your menstrual cycle. -NO water, cleansers, creams, makeup or any other products on treated area for 10 days. -DO NOT rub, pick or scratch the treated area. Let any scabbing or dry skin naturally exfoliate off. Picking can cause scarring. -Avoid direct sun exposure or tanning for 3-4 weeks after procedure. -Avoid heavy sweating for the first 7-10 days. -NO facials, botox, chemical treatments and microdermabrasion for 4 weeks (nothing that can serve to exfoliate the area). -Avoid sleeping on your face or digging the side of your face into pillow for the first 10 days. -Please note: Eyebrows will appear darker and bolder due to natural healing for the first 10 days. 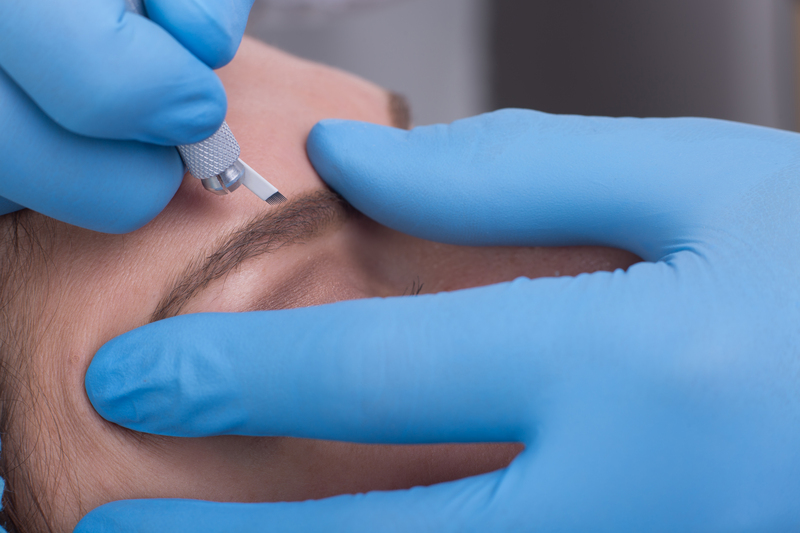 This is very common for all permanent cosmetic procedures.